This kitty came to us one summer, towards the end of summer. As usual, we caught him, easily, he wanted to be picked up, and looked him over with an eye towards having him neutered and given the proper care at the vet. His leg had an open wound which we thought must have come from an altercation with one of the other resident kitties, so Mom treated it and waited for it to heal. And waited. And waited. In the meantime the kitty proceeded to drink half a gallon of water each day and to process all of it into his litter box. Each day. 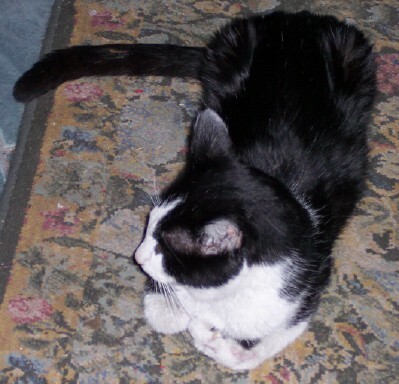 So mom treated him for worms, and continued waiting for the leg to heal, and concluded that we had a kitty with diabetes, but not enough money to pay for the complicated treatment required for such a condition. Ms. Schultz conducted several Reiki sessions and each time he rallied. Mom fed him water with a dropper, and special soups and foods and teas, courtesy of Winterhawk, but all to no avail. And he went to rest on March 17th, 2008. The fight this cat put up was remarkable, and we are glad to have had him with us for the time he chose us. In memorium, MEOWLKAVICH. 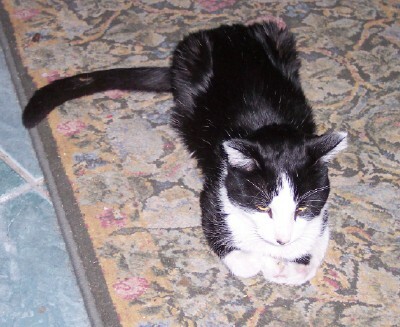 He struggled against some health issues that were just too much for this one of his nine lives. One evening all the little girls made a fuss over him, at bedtime he and Mom watched a nice video, BIRDS OF THE BACKYARD, and then he went to sleep. Thanks to Denise Schultz and company for their support with Reiki and healing recipes through his illness.